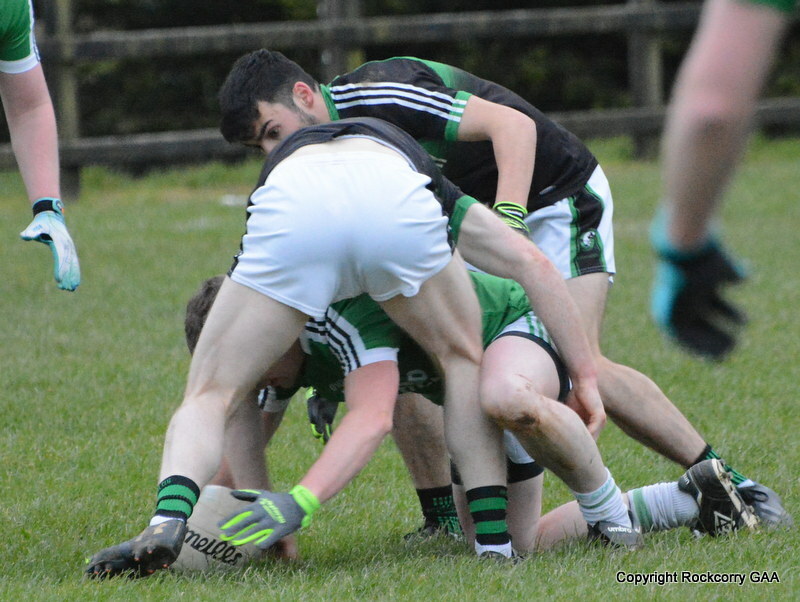 Our reserve footballers played their third game in the Platinum Tanks Reserve Football League when they hosted Carrickmacross at Pairc Naomh Mhuire last Sunday 30th March. In what were undoubtedly very difficult and slippery conditions due to all the recent wet weather the match was fiercely competitive but was also littered with poor passing and there were too many unforced errors. However, the lads gave a spirited & courageous performance where their unquenchable attitude & work-rate prevailed as they secured the win on a score-line Rockcorry 1-13 Carrickmacross 1-8. 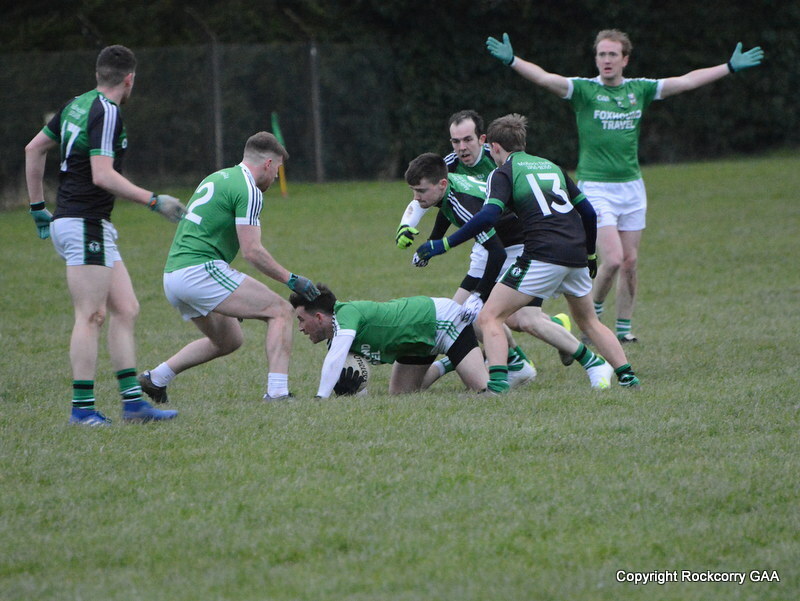 A full match report and a selection of action photographs can be viewed on our official website www.rockcorrygaa.ie or visit our Facebook page. 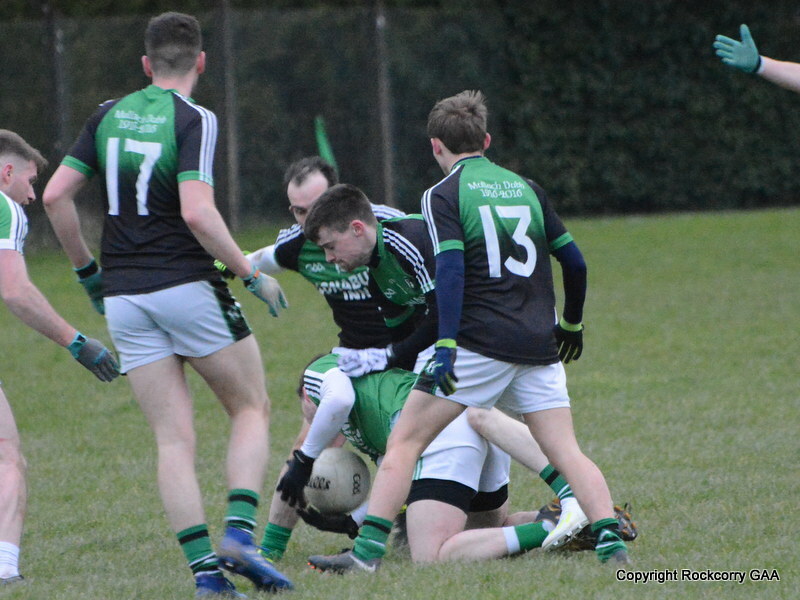 Well done lads, you can rightly be delighted with this win so keep up the good work because our next outing in the league campaign is this Saturday 5th April when we travel to play Aughnamullen at 7pm. 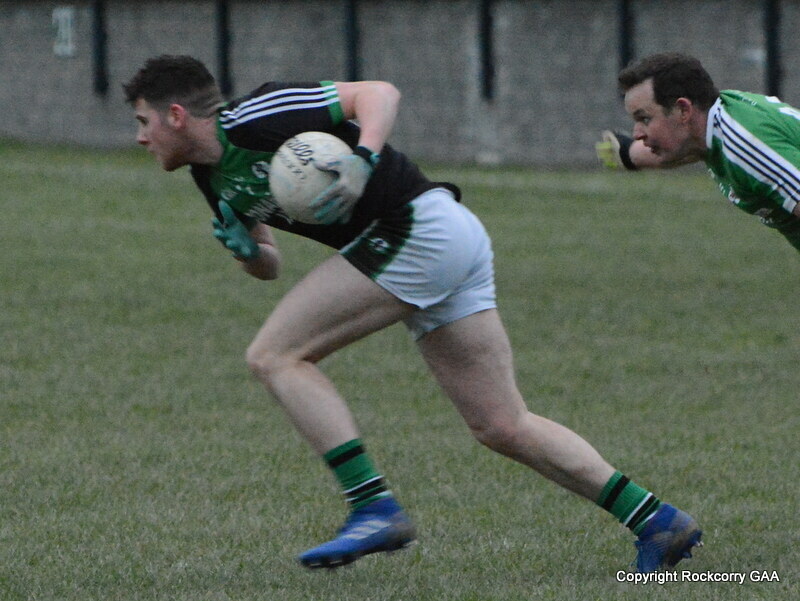 Our senior team will be back in action on Saturday 12th April with a home game against Inniskeen and throw-in time is 7.00pm. They have another home game on Wednesday 16th April when they entertain Carrickmacross at 7.15pm and on Sunday 20th April they travel to play Tyholland at 4pm. On behalf of the club I want to wish the very best of luck to the Monaghan Under 21 team when they travel to the Athletic Grounds, Armagh this Wednesday 2nd April to play local rivals Cavan in the semi-final of the Cadbury’s Ulster Championship. All the best lads and leave it all on the field! Niall McKeown has been chosen to captain our senior team this year and takes over the reins from Keith Daly. 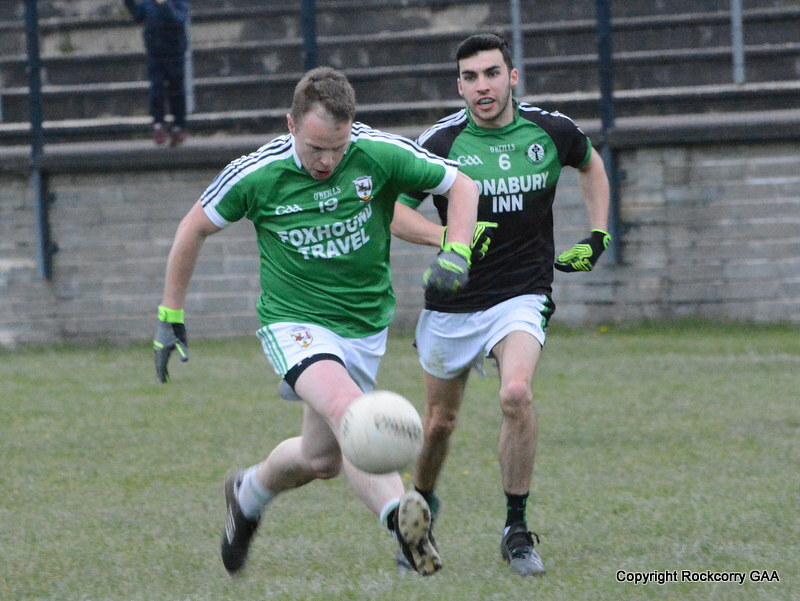 There are always natural leaders within a team and Niall is now a regular feature on our senior team and has shown on many occasions his talent and all-round ability. He is a young man who has a great work ethic and he certainly leads by example on the field and brings a great attitude to the squad. He has shown wonderful leadership qualities in recent years and continues the McKeown tradition of proudly wearing the ‘Nr. 3’ jersey and just like his father, Gerry; he shares the same qualities “Thou Shall Not Pass.” Dwayne Rooney has been appointed the reserve team captain and is one of the clubs most experienced players who lives, breathes and sleeps Rock GAA. He has a fountain of knowledge to pass onto the younger players and is a great man to have on board with his wonderful leadership qualities. On behalf of the management committee and indeed all our supporters I would like to wish Niall & Dwayne the very best of luck during their captaincy and hopefully they will inspire their team-mates to achieve something very special in 2014. NO Mouthguard? – NO Game! Attention ALL players, wearing a mouthguard is now mandatory and it is the responsibility of each individual player to buy and use a mouthguard. For your information, if a player refuses to comply he can be sent-off and more importantly YOU will not be covered under the GAA Player Injury Scheme if you do not wear a gumshield. If ever there was a game that deserved the old classic cliché “it was a game of two halves” then the under 12 encounter between Rockcorry v Sean McDermott’s in the Gerry’s Prepared Veg Spring League Zone G was it. The game was last Saturday 29th March and was played in dull and miserable conditions but the day was brightened up with some delightful passages of football as both sides adopted well and did their best with the wet and slippery underfoot conditions. In what was definitely a game of two halves the opening half Sean McDermott’s enjoyed the majority of possession and totally dominated proceedings and pulled away with a comfortable lead, leading 0-1 to 0-11 at the interval. The half time pep talk seemed to work wonders for our lads because when play resumed we stepped up our intensity, work-rate and execution and notched over some unbelievable scores, a number of which were from very tricky angles, and they kept the pressure on right up to the final whistle and were rewarded with a hard-fought victory, by the narrowest of margins, on a final score-line Rockcorry 0-14 to Sean McDermott’s 0-13. Please visit our Facebook page or our Flickr site to view a selection of action shots. The next outing for the under 12 footballers is a home game against Tyholland on Saturday 12th April at 12 noon. The under 14 footballers will be back in action this Saturday 5th April when they travel to play Oram at 12 noon. Coaching for the under 10 footballers continues every Monday & Thursday evenings between 6-7pm. Times may alter and parents will be advised accordingly by our SMS text service. The first under 10 Go Games blitz will take place on Saturday 19th April and will take place at Sean McDermotts between 10am to 12 noon and other teams will be Ballybay & Drumhowan. The first under 8 Go Games blitz will take place on Saturday 26th April at the same venue and the same teams will compete. Please visit our website www.rockcorrygaa.ie for full details and schedule of dates for the under 8’s and under 10’s Go Games Blitzs. Following the hugely successful and mind-blowing Parish Variety Concert that was held on Sunday 16th March the final bit of business was taken care of this evening when members of the organising / fund raising committee got together and handed over an impressive cheque of €4,587.68 to Fr. Gerry White. Once again a massive well done to everyone involved it was an amazing concert with awesome performances by all the participants and we look forward to the next show with great anticipation. The numbers drawn on Monday 31st March were 6, 20, 27 and 28. There was no jackpot winner of €7,500.00. The following won €15 each :- Maggie Reilly, Rockcorry, Mark Duffy, Rockcorry, Breda McCaul, Drumcaul, Pheobe Carroll, Rockcorry, Sean McGovern, Clones, Mary & Shane, Dartrey P.O., Aaron Duffy, Rockcorry, Felicity McFadden, Rockcorry. Next week the jackpot will be €7,600.00 and the draw will take place in Fitzpatrick’s. Thank you for supporting our Top 4 lotto draw. Please note that all tickets should be handed in no later than 8pm on the night of the draw otherwise they will be included in next week’s draw.